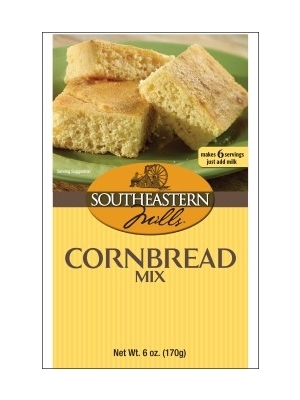 Southeastern Mills Classic Cornbread mix is the perfect complement to hearty soups and chili. Grease an 8" x 8" baking pan (or 9" x 9" for thinner corn bread). Combine corn bread mix and water. Pour batter into greased pan and bake in middle of oven for 25-30 minutes. ENRICHED WHITE AND YELLOW CORN MEAL (CORN MEAL, NIACIN, REDUCED IRON, THIAMINE MONONITRATE, RIBOFLAVIN, FOLIC ACID), WHEAT FLOUR, PALM OIL, LEAVENING (SODIUM BICARBONATE, SODIUM ALUMINUM PHOSPHATE, MONOCALCIUM PHOSPHATE), DEXTROSE, DRIED BUTTERMILK, SUGAR, DRIED EGG YOLKS, DRIED EGG WHITES, SALT, GUAR GUM, WHEAT STARCH, CITRIC ACID, PARTIALLY HYDROGENATED SOYBEAN AND COTTONSEED OIL, MALTODEXTRIN, NATURAL FLAVORS, TBHQ. CONTAINS: WHEAT, MILK, AND EGG. Quick, simple and easy. Nice texture to it. This would be fantastic for teaching kids how to cook.